With the vacation it has been almost three weeks since I last visited the local farmers market and I am really starting to miss it! No matter, the grocery stores are still full of local produce including lots of cheap zucchini and I knew just what I could use some for. This zucchini pistou recipe, originally from from Cooking Light, has been making its way around the food blogging sphere and it seemed a really nice way to enjoy some fresh zucchini. A pistou is similar to a pesto and since pestos can be made from many different ingredients, why not a zucchini pistou? 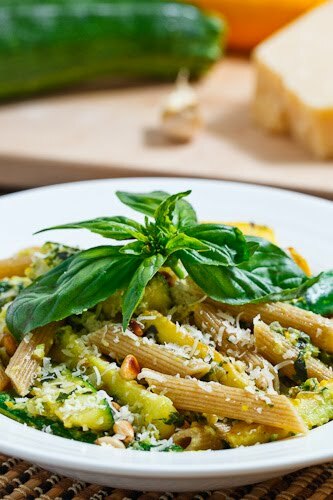 I particularly like the way that this recipe includes zucchini in two different forms, both pureed in the pistou and sliced in the pasta for lots of zucchini goodness. For the pasta I went with penne noodles as whenever I make a zucchini pasta I like to cut the zucchini in roughly the same shape and size of the penne noodles. This zucchini pistou is really easy to make and a perfect way to use up some of your remaining zucchini! Add the zucchini and saute until tender, about 5 minutes and set aside. Place 1/3 of the zucchini in a food processor along with the basil, parmigiano reggiano, garlic, pine nuts, lemon juice, salt and pepper. Add the remaining zucchini and set aside. Meanwhile cook the pasta as directed on the package reserving 1/3 cup of the pasta water when you drain it. Add the reserved pasta water to the food processor and puree it contents. Add the pistou to the pasta along with the zucchini and heavy cream and toss to coat. Serve garnished with parmigiano reggiano and pepper. Mmmm, this looks delicious. I love me a good farmer's market. So easy to get carried away with them though. I love it when you post a recipe that I have all the ingredients for. This looks great! it sounds delicious! I like how it looks and how it comes together. Very healthy! mmm, I love anything with zucchini in it and it's nice to have alternatives to traditional pesto sauce. I cook in a small kitchen as well (the galley on a boat). It certainly has it's challenges as well as rewards! I've never had pistou before but I've heard of it and have always loved the concept. And right now, anything that has zucchini in it, sounds good to me! Hey, my GF and I just made this based on your posted recipe. Unreal. Prolly the best recipe we've tasted from here yet. Keep it up Kevin. We'll make some kimchi and bulgogi based on your guidance soon too I imagine. Me encantan los calabacines, esto tiene que estar riquisimo. This looks delicious Keven. Another great recipe to use all that zuchinni! This sounds tasty, and like a great way to use all sorts of veggies – my question is, are there any vegetables that wouldn't work for a pistou? This looks like a great new way to use all my zucchini! Thanks for posting another great recipe! I have made this Cooking Light recipe and was more than happy with the results. this looks amazing! and healthy too. This sounds like such a perfect recipe. I have a couple of zucchini, but I've threatened to put them in muffins. Thinking I may change my mind now. It seems tasty but if you ar interested in real italian way of life and italian cuisine, take a look at my blog http://italy-recipes.blogspot.com/ and, please tell me what do you think about it. I simply love zucchini in pasta! What a wonderful looking dish! I love zucchini. This looks like a great way to try it! It seems we were both at IFBC- too bad we didn't connect, I'm also from Toronto and it would have been nice to meet you! That looks fantastic – and recipes to use up zucchini at this time of year are always welcome! Ooo this looks really good! This is really something so delicious. I would love to try this at home. Thanks a lot for sharing.